Rockpile looks over the intruder to his Covenant of the Sword facility and is unimpressed by his appearance. SuperPatriot is distracted by visions of Dragon which enables his foe to immediately take the advantage as fight commences. The hero manages a momentarily comeback when he tears a chunk out of Rockpile’s torso which reveals a diminutive person inside. 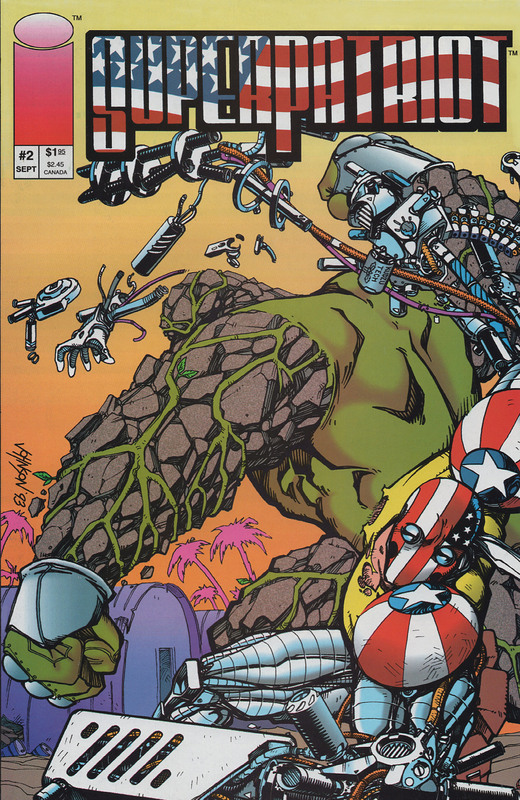 Rockpile absorbs one of SuperPatriot’s mechanical arms to repair the damage before he tears the remaining limbs away. The battle is ended as the Covenant arrives in greater numbers to take their prisoner away. As the Covenant’s scientists place their captive in a brain-washing machine, SuperPatriot’s memories begin to rise up to the surface. In 1992 he leaps into a warehouse where three members of the Vicious Circle are carrying out some illegal activities. SuperPatriot holds his own briefly but HellRazor slices him open and distracts him long enough for Basher to knock him down with a thrown crate. This then leaves Mako to pin their enemy down and begin feeding from him. This memory cuts away to another which features the Liberty League meeting up in 1969 to discuss current politics. SuperPatriot suggests breaking their ties with the government due to activities unfolding in the Vietnam War and other issues. Battle Tank does not agree with this decision as he feels that they need the government to keep financing them. This leads to both heroes abruptly quitting the team and leading to its ultimate disbanding. One final flashback involves SuperPatriot in 1941 where he breaks into the laboratory of a Nazi scientist and fights his way through the numerous guards. He is too late to prevent his target from activating a large robot but as this creation makes its move, SuperPatriot begins to see him as a giant version of Dragon. This prompts the scientists working on their prisoner to shut down their equipment before an electrical power surge destroys all of their efforts. The scientists decide that they have proceeded as far as they can without getting a further ruling by the Council and send on their work for evaluation. The Covenant’s leaders discuss the matter and it is decided that through the use of their technology that they can improve SuperPatriot’s weapons systems so that he can be a living weapon of their own. An idea is then formulated about just how they can utilize this new pawn.